CCI Solutions makes it so easy to work with them. Their straightforward approach gives me the results I’m looking for and makes the whole process, from design to implementation, work well for Saddleback Church. Their team is flexible, fast, kind, and organized, but most importantly they listen to my needs and deliver great results." In 1980, new to Orange County, CA, Rick and Kay Warren began a journey with Saddleback Church that more than 35 years later has expanded to 13 campuses in CA and 4 additional international campuses. With more than 20,000 people in weekly attendance across all 17 campuses, Saddleback is considered one of the largest churches in the world. Yet what has always most impressive about Saddleback Church is their commitment to people, both who they are and the communities in which they live, which is a key part of why their multi-campus approach has been so successful in helping them reach more people. On Christmas Eve of 2010, with a strong desire to reach more specifically into the Anaheim, CA area, 300 people gathered to launch the new Anaheim campus. Over the course of the next few years as a portable church, the Anaheim campus continued to grow and bring in more people from surrounding areas, reaching attendance well over 1,000 people per weekend. But due to the portable nature of the campus, ministry activities had to be kept to the weekend only, which limited the reach and potential of what the Anaheim campus could do. 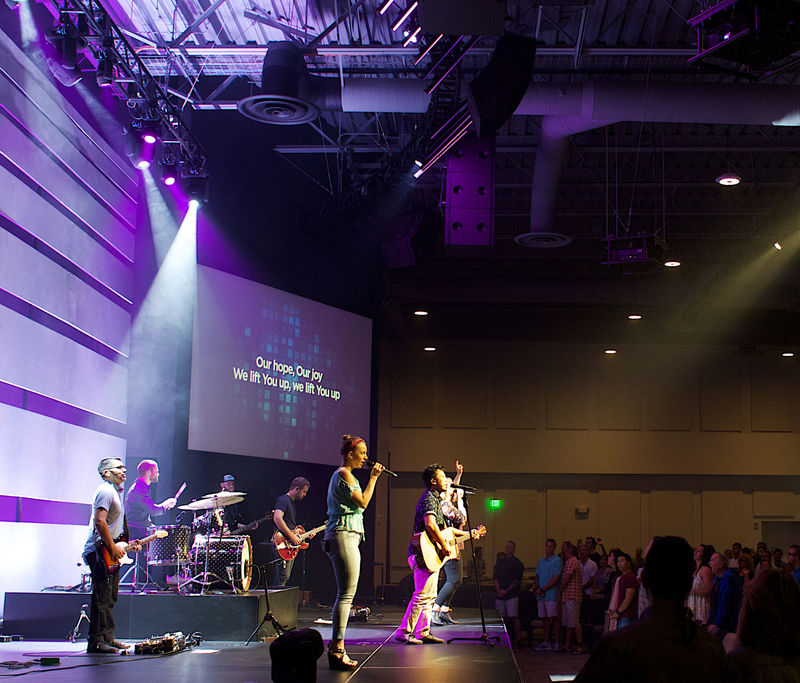 In 2014 that all changed, when Saddleback Church renovated a former L.A. Fitness across the street from the Angels of Anaheim stadium and opened up their new home, complete with 1,000 seat auditorium, community gathering space, and of course ample room for a growing youth and kids ministry. 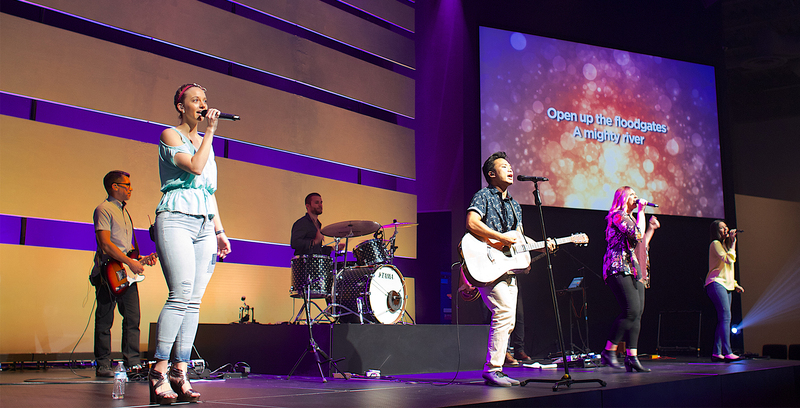 With a tight timeline and a lot of renovation work ahead of them, Saddleback Church turned to their longtime partner CCI Solutions to handle the audio, video, lighting, and acoustics of their new home. As with all Saddleback multi-site venues, two key priorities drove the project: amazing audio clarity and coverage, and outstanding delivery of the video message from the main Lake Forest campus. With an extremely wide room and the quality bar set extremely high by the team at Saddleback, CCI Solutions designed an L-Acoustics based speaker system that knocked it out of the park. “The best way to describe it is a ‘left-right-left’ stereo system,” says Greg Baker, Global Technical Director at Saddleback Church. 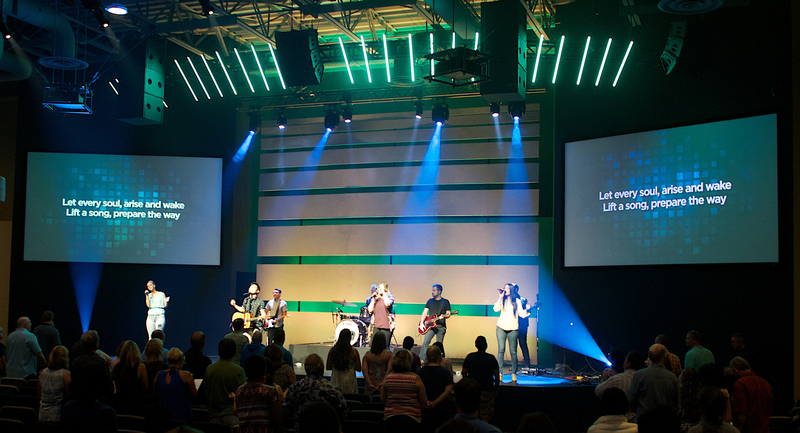 “When we heard a demo using the same boxes that they planned to put in here, they were everything we needed them to be: very musical for our worship performances and highly intelligible for the audio from our main pastor’s message. Now that they’re installed here, we’re getting exactly that, in what would otherwise have been a potentially problematic environment. We’re filing every seat with even, consistent sound. L-Acoustics and CCI Solutions really came through for us.” With FOH mixed on an AVID SC48 and a full complement of Sennheiser wireless microphones and IEMs, the audio system delivered everything Saddleback wanted for their new space. With video being such a substantial part of each service, with Pastor Rick’s messages often being 2-3 times the length of the worship time, video delivery of the message from the main campus had to make everyone in this wide room feel engaged to every word being spoken. Two 16’ by 9’ screens with Christie D12HD projectors bring video to life for the 1,000 seat room, mixed from a Ross Crossover Solo. Video content from the main campus is delivered via a Grass Valley T2, ensuring rock solid delivery of the message. The rest of the video system is rounded out by various support devices from Black Magic and Marshal Electronics, covering everything from routing to rack displays. Lighting for the Anaheim campus had to be not only very power friendly, but as maintenance free as possible, so a 100% LED approach was taken to light up Saddleback Anaheim’s stage. Featuring LED ellipsoidal and moving spot and wash fixtures from Chauvet, the designed lighting rig can deliver both the even coverage that the occasional camera usage requires in addition to the dynamic looks that are desired for worship times. With programming handled by a Martin M1 lighting console and architectural controls handled by Interactive Technology’s CueServer, the lighting rig combines the best of all worlds with a lot of creative horse power and the most simple of operation.